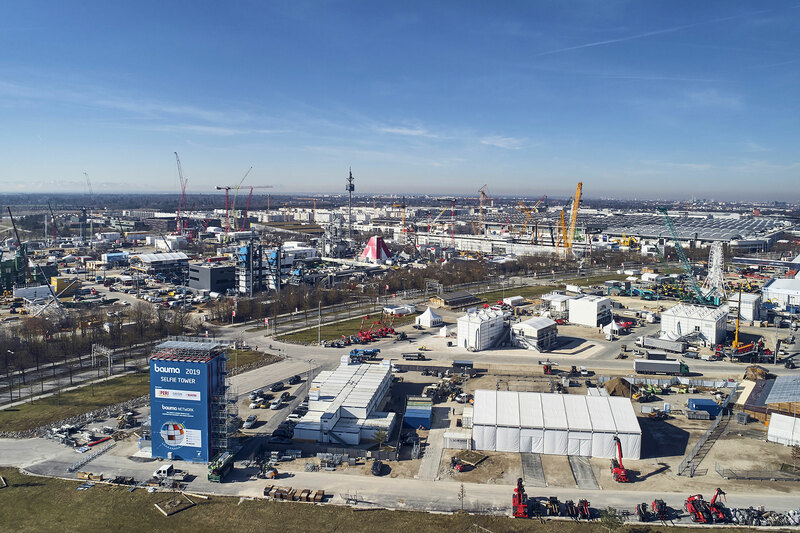 At 614,000 square meters of exhibition space, bauma 2019 is larger than the smallest town in Germany: Arnis in Schleswig-Holstein (450,000 square meters). The area occupied by bauma is about three times that of the Allianz Arena in Munich. The 600,000 visitors that are expected come from more than 200 countries. That is more countries than UN member states. On the day when most visitors attend the fair, “Super Saturday,” around 21,500 cars and 1,000 buses are expected. In addition, on this day about 250 trucks from the exhibitors are parked on the exhibition grounds as well as 500 caravans at the sites at the Riem Riding Stadium. In 2016, the visitor with the longest travel distance came from New Zealand. He traveled 18,485 kilometers so as not to miss bauma. On average this involves around 30 hours by plane. 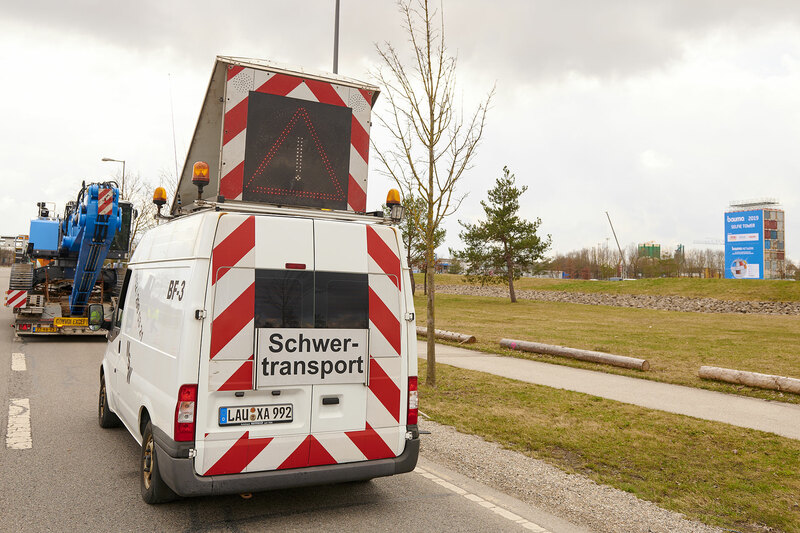 During the construction and dismantling of bauma, more than 13,000 trucks and more than 600 heavyweight vehicles travel to and from the exhibition grounds. If they were to form a chain, it would stretch from Munich to Nuremberg. bauma is the only trade fair for which Messe München rents surrounding areas. 5,500 meters of extra fencing are required to fence off these areas. If all the outdoor booths were stacked on top of each other, you would have a building with 481 floors and an overall height of 1,500 meters. To put this in perspective: The world’s highest building, the Burj Khalifa skyscraper in Dubai, is just 828 meters high. The exhibitor that requires the longest erection time is construction machinery manufacturer Liebherr: It takes 160 days to build and erect the three-floor booth. Work began on October 30, 2018. Liebherr is also at the top when it comes to the exhibitors with the most employees: The company brings 1,500 employees to the fair. The Wirtgen Group arrives with more than 800 people, while 650 employees attend the fair for Doka, the formwork expert. The absolute heavyweight of all the exhibits is Liebherr’s LR 1800 crawler crane. It weighs 1,070 tons, which corresponds to the weight of 25 airplanes. It required 42 individual transports. Second place in terms of weight is Komatsu’s hydraulic excavator PC 4000, which weighs 400 tons. It is about the same size as a detached house. In the “smallest” category, the electric compact excavator E10e from Doosan-Bobcat takes the lead: The first mini-excavator in the 1-ton class is just 71 centimeters wide and can fit through a standard front door of a house. Before the heavyweight machines from Caterpillar and Putzmeister can enter Hall B6, 108 additional roof supports will be installed in the basement vault below the entrance so the floor can withstand the weight. The exhibitors with the largest areas are Liebherr, with 14,401 square meters, the Wirtgen Group, with 12,960 square meters, and Caterpillar, with 11,237 square meters. The area taken up by the top 3 corresponds to more than five soccer fields. With 179 exhibits, the Wacker Neuson Group will be bringing the most items to the exhibition. On the outdoor area, the manufacturer will be exhibiting a whole boulevard of electric and rechargeable machines and appliances. The Wacker Neuson Group also has the most noticeable visitor attraction: a Ferris wheel. In 24 cars, four to six people can enjoy the view from a height of 40 meters for free. This means that Munich will have two Ferris wheels at the same time in April: Four days after bauma, the Hi-Sky observation wheel will be opened in the Werksviertel district. 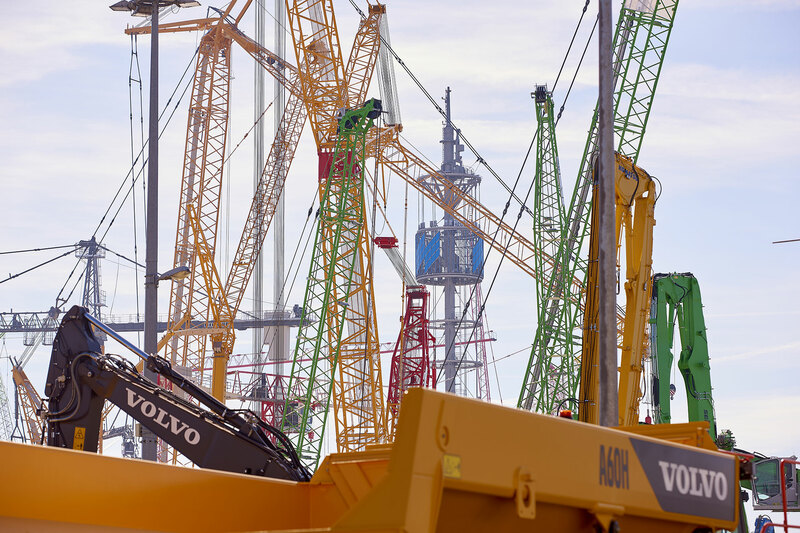 About 40 cranes form the famous bauma silhouette this year. During set-up, attention has to be paid to different heights so that they do not collide. The media center at bauma 2019 is located on the 2nd floor above the main entrance west. Accreditation for journalists is available beforehand at: https://www.bauma.de/press/services/accreditation/index.html. More information is available in the Newsroom. More information at www.bauma.de.